OK OK after this, I promise it'll be all fall manis on here! I just always hate to see summer go. The end of summer means it starts to get dark and cold and stays that way for what seems like forever here in CT. I needed one more neon mani to prolong the feeling of summer, so I made it a good one. This is Lynnderella Fairy Kitty over China Glaze Highlight of My Summer. Highlight of My Summer is one of my favorite neons, because it's a neon mint! 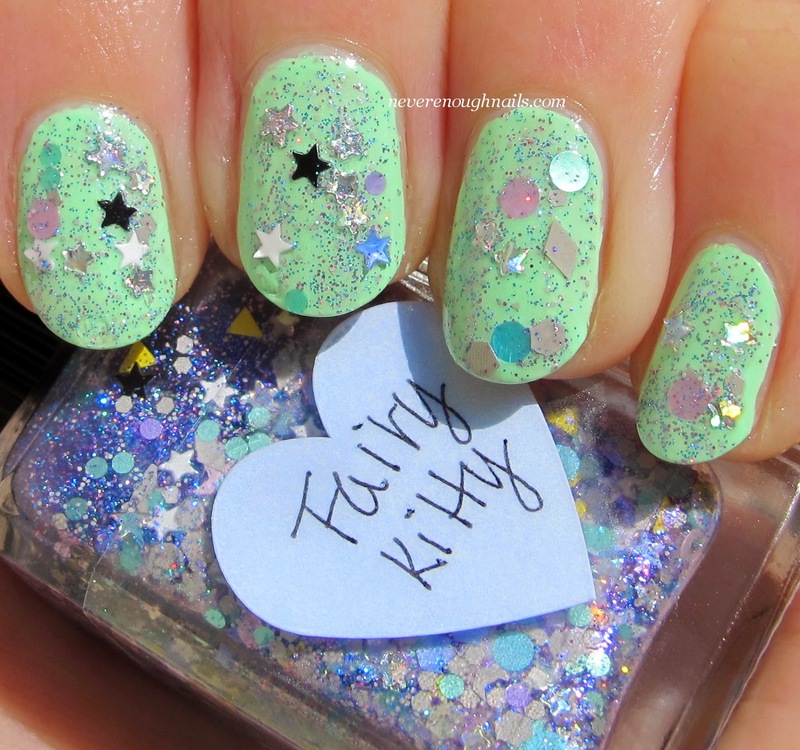 And I knew I needed Lynnderella Fairy Kitty just for the name, but it's also a gorgeous polish. It has a mix of soft lavender, mint, blue, white, a few black glitters and some silver holo star glitters in a clear base with tons of tiny lavender and green sparkles. This is just one coat of Fairy Kitty over three coats of Highlight of My Summer. 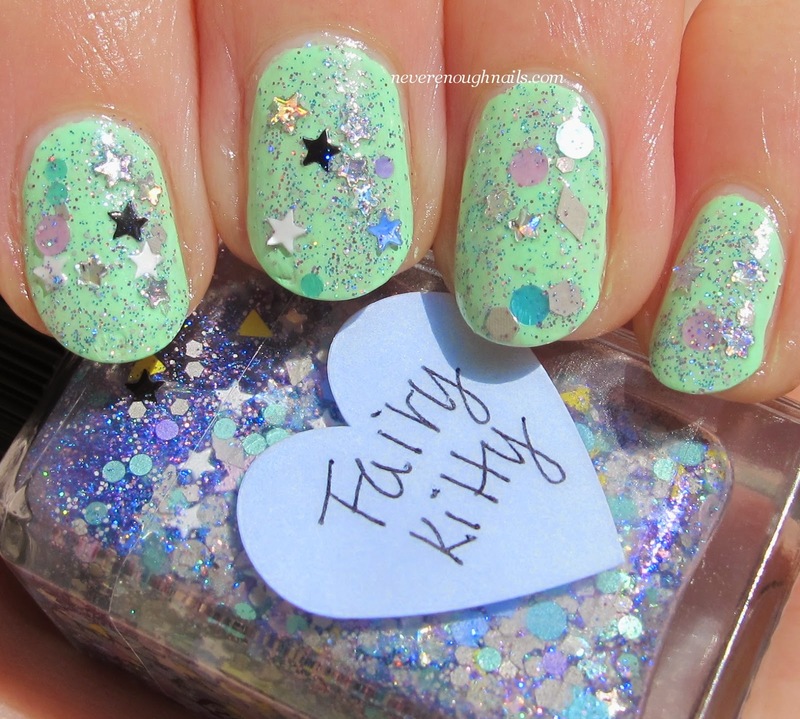 Fairy Kitty was easy to apply and has plentiful glitter. 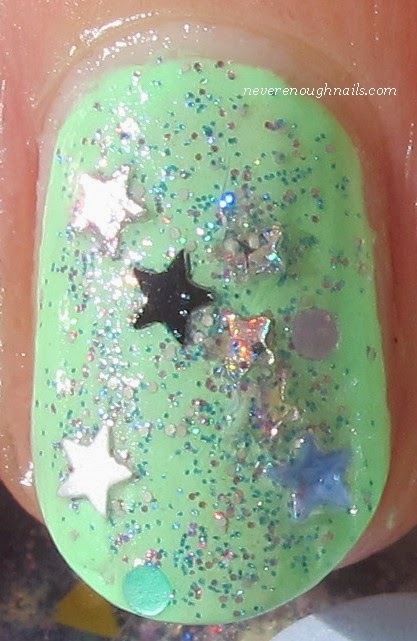 When I use polishes with star glitter, I usually have to press the corners of some of the stars into the polish when it's damp, especially if I end up with a star on the curving area of my nail. But I love star glitter, so it's worth it! So I guess this is see you later summer and summer manis! I better start building my igloo for the winter. China Glaze Highlight of My Summer is still around on some polish sites, like 8ty8beauty.com. Lynnderella Fairy Kitty is a LE Lynnderella, but I believe there are still some bottles of it left. It will be available again at lynnderella.com or possibly on the Lynnderella Storenvy. Zoya Fall 2014 Ultra PixieDust Swatches! Zoya Ignite and Entice Tone on Tone Dot Mani! OPI Peanuts Halloween 2014 Swatches! NYC Fashion Queen Collection Preview! OPI Pink of Hearts Duo Swatches! OPI Gives Us a Sneak Peek at Spring at NYFW! Zoya Ignite Fall 2014 Swatches!